In San Francisco, San Jose, and Los Angeles, adding manufactured stone veneer to a home is the most profitable home-improvement job, returning more than 130 percent of its original cost at the time of sale. In Santa Rosa, nearly half of all tracked remodeling projects return more than 100 percent on investment. Adding an upscale master suite is the most expensive improvement that Los Angeles homeowners can make, at about $330,000, but it nets only about two-thirds of that cost when a home is sold. Whether you live in the Bay Area’s two largest cities or you call Los Angeles home, there’s one improvement that is guaranteed to reap returns when the time comes to sell. 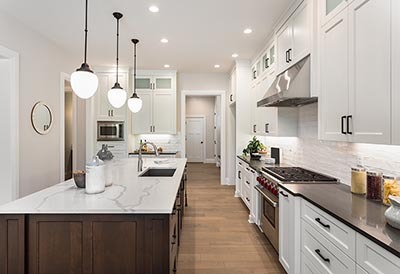 Remodeling’s 2019 Cost vs. Value Report tracks 22 home-renovation projects on a national, regional, and metropolitan-area level to determine how much each job will recoup at the time of sale. Nationwide, none of the improvements are projected to actually turn a profit, though upgrading a garage door nets the biggest return on investment, at 97.5 percent of the average $3,611 cost. In the San Francisco, San Jose, and Los Angeles metropolitan areas, installing manufactured stone veneer is the home improvement with the largest return. Remodeling defines this project as removing 300 feet of vinyl siding and replacing it with a stone substitute, with job costs ranging between $9,000 and $11,000 in those three California cities. Adding manufactured stone veneer returns 153.6 percent of its cost in San Francisco, 131.4 percent in San Jose, and 130.1 percent in Los Angeles. In Santa Rosa, building a wooden deck packs the biggest bang per remodeling buck, returning 175.6 percent of the average $17,087 cost. Building a composite-based deck in the Wine Country also returns more than 150 percent on investment, as does upgrading a garage door and replacing a roof using asphalt shingles. Nine of the 22 projects tracked in Santa Rosa return more than 100 percent of their costs. In Los Angeles and San Francisco, a respective six and five improvement projects are expected to add value at the time of sale, while stone veneer is the only profitable renovation job in San Jose. So what are the home improvements that cause Californians to lose the most money when they put their homes on the market? In both San Jose and San Francisco, it’s a new metal roof, which returns a respective 56.5 percent and 71.6 percent of its cost. In Santa Rosa, a major, upscale kitchen overhaul will bring in just 57 percent of its nearly $150,000 price tag. And in Los Angeles, the most expensive renovation generates the smallest return, with the average $331,520 high-end master suite addition bringing back about two-thirds of its cost.